The plan for this week’s post was to travel back to 1983 and talk about some of the records I bought back then. But I was, and still am, truth be told, struggling to think of anything much of interest to say about any of them. So as I was lazing around my blog-cave today, seeking inspiration by watching “Pride” (which is rapidly becoming my favourite film ever; if you’ve not seen it yet, I urge you to do so: it’s the one of the best films ever about the relationship between gays, lesbians and striking miners. Well, I say one of the best: it’s definitely in the Top 10 of that saturated genre, anyway), when I received an email from See Tickets, telling me that my tickets for this year’s Glastonbury had been posted out to me today. Reading 1989 was an experience I was not keen to replicate, hence the 14 year gap before I attended another festival. This was the first year after it stopped being “Reading Rocks” (I believe a bottle of piss throwing incident involving the crowd, Meatloaf and Bonnie Tyler was the final nail in the coffin of that particular incarnation of Reading. Tyler has subsequently apologised). My reluctance to go to another festival had nothing to do with the line up at this one: the headiners were Friday: New Order (tick! ); Saturday: The Pogues (tick! ); Sunday: The Mission (ah well, can’t have everything, I suppose). Utter virgins at this kind of thing, me and my mate Ian had turned up with a borrowed tent on the Friday morning, pitched and rocked up to the Main Stage (I say Main Stage, my recollection is that it was the only stage, although I’m open to correction there), just in time to a) miss Gaye Bikers on Acid (result!) and b) catch Spacemen 3. I was already a massive fan of their “Revolution”, which regular readers may remember I posted a while ago in those wildly optimistic pre-election days. Next up were My Bloody Valentine: this would have been around the time they were starting to record the masterpiece that is their “Loveless” album, and so the set comprised, as far as I recall, mostly of early versions of what would go on to become that fine album. I was totally blown away by them. And of course they played this, which I still think is one of the greatest, noisiest records ever made that I somehow managed not to buy. But anyway, I digress. This isn’t about Reading or me DJ’ing – I can talk about both another time. And I will. You’ve been warned. 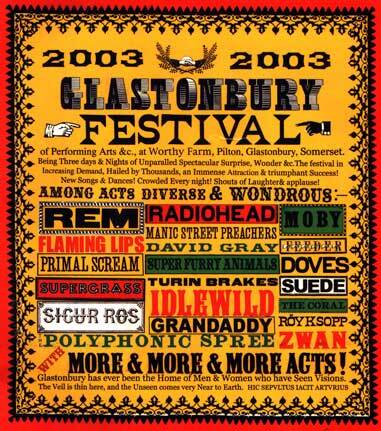 So, Glasto 2003. 10 of us had managed to get tickets – these were the days before it sold out in 26 minutes, and we’d all spent hours redialling and clicking refresh. Seven of us hired a minibus and drove up from Cardiff on the Thursday, the other three came from further west in Wales (Neath) and we not only all managed to meet up, but also pitched our tents together. 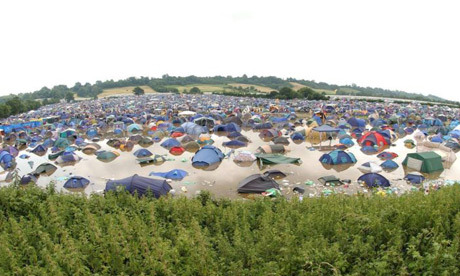 This would not happen these days; if you’re not there first thing Wednesday morning when the gates open, you’re going to struggle to find space to pitch one tent, let alone a group of tents. Somewhat optimistically, we pitched them in the round, and woke up on the Friday morning to find someone had pitched theirs right in the middle of our group. Morning! You’ve probably noticed a reluctance in the past for me to name people I’m writing about (I haven’t even told you my brother’s name, and he’s been mentioned loads), and that’s because I wanted to afford them some level of anonymity, just in case I ever write about anything on here they would rather I didn’t announce to the world. But usually I’m just talking about one person, and they know I’m writing about them; now, with 10 of us, I think it’s time to call a register. There was me (Hello! Nice to meet you. Thanks for stopping by), my flat mate Llyr, his sister Hel, two of our mates O’Keefe and Ballard (mates from work, both blokes, hence referred to by their surnames, as is the tradition), Mike and Vicky (married, from Neath), Johnno (not a bloke, hence everyone else apart from me calling her Claire), Mark and Val (couple, also from Cardiff). I wish I saw all of these people more often than I do these days. What a merry band we must have looked as we all wandered around the site on the Thursday afternoon, drinking in the atmosphere, before visiting the late night fun on offer that night, and then we finally traipsed off to the Pyramid Stage ready for the first act, on stage around mid-day on the Friday. We decided we’d head towards the back of the field (stopping off at the bar on the way up, of course) and positioned ourselves right at the top of the slope. There’s a first aid tent there we decided was a convenient reference point in case any of us got lost. I’ve used this as a rendezvous every year that I’ve been since. First act on were The Darkness. This was before they went massive – or as massive as they got – and imploded (before reforming). We’d never heard of them, but were all pretty impressed with them. About mid-way through their set, it started raining. Of course it did. Disorganised Glasto virgins as we were, none of us had considered bringing waterproof clothing out with us, so we all purchased what was essentially a transparent bin bag with a hood and two arm holes cut into it from an enterprising local who wandered past. Hilariously, Mark’s only had one arm cut in it, and I will never forget the utterly pissed off look on his face as he attempted to smoke a cigarette using the tethered arm, as rain dripped off his brow. Next up was the newly reformed Inspiral Carpets, who we all loved, being from “our era” as they were, followed by Echo & the Bunnymen, who the continued rain seemed to suit (and who I also loved). It was a running joke for years later that wherever we went, Mr McCulloch and co would be playing somewhere; it was some years later before a year happened where we didn’t see Echo & the Bunnymen play. Still the rain continued. It was that fine rain, the sort that soaks you right through. Some of the gang wandered off to go and watch other things – namely Junior Senior, and Har Mar Superstar, the latter of which has resolutely failed to tickle my fancy. But I remained, along with a few of the others to watch the Inspirals and the Bunnymen. Later acts were De La Soul and Jimmy Cliff, and it was during one of these acts that the sun finally decided to reappear. It’s such a simple pleasure, but there’s very little better in this life than the sun coming out at Glastonbury; you can feel the mood of the whole place lift. 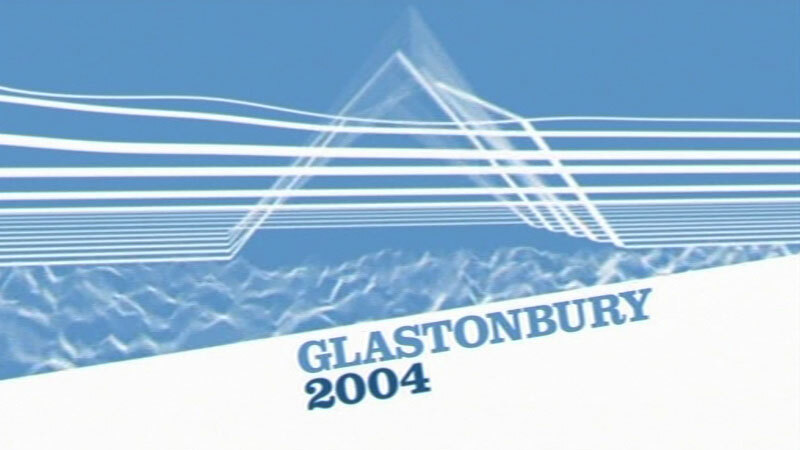 You can tell this was my first Glastonbury, because I pretty much spent the rest of the weekend in the same spot, watching all the acts come and go on the Pyramid Stage. This was fine by me, for although The Other Stage culminated on the Friday with Super Furry Animals, with Primal Scream headlining, R.E.M. were playing the Pyramid, and there was no way I was going to miss them. This would be the third time I’d seen them, and I still say that the greatest gig I ever went to was not this one, but R.E.M. at the Newport Centre in 1989 promoting the Green album. More of that another time. R.E.M. would at this time, 2003, have been promoting, or at the very least working on, their “Around The Sun”, generally accepted as being the worst album they ever made. This is not a consensus I would disagree with; bar one, maybe two songs, it’s an absolute stinker. Thankfully, most of the songs on there were still in their early stages, so we were subjected to very few of them. Instead, we basically got a Greatest Hits set, which is, I think, what you want of an established band at a festival. Their gig was also memorable for Johnno complaining afterwards that it would’ve been nice to hear Stipe sing, rather than having my dulcet tones bellowing along to every song in her close vicinity. Here’s them doing Electrolite; ask me nicely and I’ll sing it in your ear throughout. So ended Friday. On Saturday, a few of us settle ourselves at roughly the same spot, and it was here that an extra member of our group was introduced to me. One of our little gang (who shall remain nameless, for fairly obvious reasons) had brought it upon themselves to bring some cakes with them. Brownies, to be precise. As you can imagine, there was chocolate in them. And one other vital ingredient, which you can work out for yourself. The sun was absolutely blistering that day; yet we munched on the brownies like they were going out of fashion (which they had, around 30 years earlier) and then found ourselves totally incapable of speaking, let alone moving, for the rest of the day. I remember sitting next to O’Keefe and neither of us uttering a word for about 2 hours, just looking at each other every now and then and either giggling or just staring. And this was nothing to do with not being able to be heard over the sound levels. All sorts of cretinous acts passed before us, who I would not normally have gone within a mile radius of. However it’s quite amazing how you find yourself able to endure the likes of Jools Holland and his Boogie Woogie Band (that’s probably what they were called, anyway), Turin Brakes and (I think) David Gray when you are so utterly mashed on space cakes that your legs don’t work. O’Keefe, from somewhere, suddenly managed to muster the energy to get up and move. He later told me he thought he was going to get sunstroke and decided he had to go and try and find shade, which he did, in one of the Dance Tents, where he promptly had a kip to the sound of some banging techno. One of the highlights (I think) O’Keefe missed was The Polyphonic Spree, a band I was aware of and had heard a couple of tracks by, and who seemed to be going for the record for Most People on a Stage Wearing White Smocks. They were great, perfect sunny afternoon whilst trashed fodder. Saturday night was rounded off with The Flaming Lips (wonderful) followed by headliners Radiohead, who were just incredible. I, despite my brilliant plan of making sure every one was by the First Aid tent, managed to get lost on the way back from a trip to the loo, and found myself wandering almost to the front during Karma Police There’s something almost reassuringly unsettling about meandering around, lost in the dark, utterly mashed, in a crowd of some 100,000 or so people who are singing in unison that they’ve lost themselves. Yeh, you and me both. On Sunday, I vowed that I wasn’t going to spend the whole day at the Pyramid Stage. And thus it was the case: plus everyone else swore off the remaining brownies and I was given the unenviable task of “looking after them” for the day. I decided that “Looking after them” could be interpreted as “eat as many as you like”, and I considered this a challenge I was up too. Cue me comatose outside the Acoustic Tent half listening to Roddy Frame as I drifted in and out of consciousness. The rest of the day is a bit of a blur, understandably. I know that I somehow managed to hook up with most of the gang over at The Other Stage in time to see Grandaddy (never heard of them before, loved them so much I bought some of their records when I got home), Sigur Ros (ditto) and Doves (already perfectly aware of them, thank you very much). As always, if you like ’em, go buy ’em. You don’t need me to tell you where from.